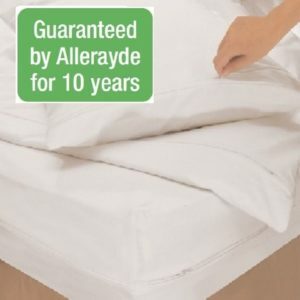 The Allerayde Single Size Mattress Encasing effectively seals out dust mite allergens for over 10 years – without sweat and tears. 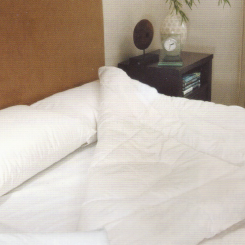 When choosing an allergy barrier cover for your mattress, duvet and pillows, the number one selection criteria is to totally encase the bedding. This protects yourself from any contact with the house dust mite and its associated allergen triggers. Therefore, it will ensure you get relief from allergy symptoms such as wheezing, coughing, itchy skin, runny nose and tearful, sore eyes. Next on the list is comfort. You need a fabric that lets your body breathe – not sweat. This means that water vapour and air can travel unimpeded. Allerayde has been developing its range of barrier covers for 26 years. Therefore, it knows how to achieve such a critical balance between fully effective allergen avoidance and essential bodily comfort. 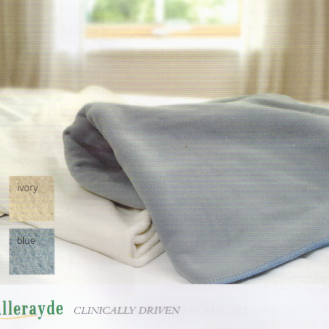 Allerayde allergen – proof single size mattress encasing is made with the highest quality sewing construction. All seams and edges are bound with seam binding for durability. Long zips allow easy fitting of covers, and our encasings are clinically effective as well as comfortable and durable. A silky and soft true tight weave microfibre, strong, lightweight, highly breathable and durable material that is totally imperceptible in use. This microfibre blocks allergens, yet allows the free passage of air and moisture. Allerayde Lite Covers have a 10 year guarantee.